Katharine Vincent describes how a dedicated group of Malawian citizens began by communicating weather forecasts to communities — and then broadened its mission to plant trees and actively restore the environment. Margaret Mead, American cultural anthropologist, is credited with the words “Never doubt that a small group of thoughtful, committed citizens can change the world.” Last week the Malawi Weather Chasers group demonstrated the reality of this statement when they led the planting of 5,000 tree seedlings in the Msambo village forest area in Msambo Village, Traditional Authority Chimutu, approximately 25km outside of Lilongwe. The Malawi Weather Chasers WhatsApp group was formed in 2016 by the country’s Department for Climate Change and Meteorological Services, which remains instrumental in its operation. The group is used to communicate weather forecasts and early warning information (see more on the group). Fully subscribed since inception and with a substantial waiting list, members work in national and local government, academia and NGOs. The commitment of the Malawi Weather Chasers is not limited to the weather. In 2017 the members self-organised to raise funds to plant 5,000 trees in Chigumula Forest Plantation, near Blantyre, 99% of which have survived to-date. Malawi has long had a problem with rapid rates of deforestation. Between 1972 and 2009, 36% of the original forested area was lost. Rapid population growth and high dependence on firewood and charcoal for fuel are among the culprits. The consequences of the deforestation are substantial. Malawi is almost entirely dependent on hydropower for electricity generation. Increased sediment load from run off on bare ground clogs the hydropower generation equipment on the Shire River. This has led to significant rolling blackouts over the past few years. Land cover change also significantly alters flood risk – one of the hazards the Malawi Weather Chasers group provides warnings on. The government has put in place measures to attempt to address the problem of deforestation. Last year, the army was deployed to patrol in protected areas to reduce the rate of illegal logging. The National Forest Landscape Restoration Strategy and the National Charcoal Strategy 2017-27 were also recently launched. But the job is bigger than government alone. At the launch of the 2018-19 tree planting season, President Mutharika urged all Malawians to plant trees. Once again, the Weather Chasers took up the call to action. Weather Chasers chairperson, Professor Sosten Chiotha from LEAD Southern and Eastern Africa, said that “tree planting is everyone’s responsibility and we can use the convening power of our WhatsApp group to support natural resource management in the country”. Above: Weather Chasers head off on their mission to plant trees. Donations from members raised over US$1,400, augmented by the sale of branded t-shirts donated by the Churches Action in Relief and Development (CARD), a member of the ACT Alliance, a grouping of church organisations that has its own tree cover project. And the Malawi Red Cross Society showed their commitment to reversing deforestation through donating the tents used at the function. A tree planting committee designated by the Weather Chasers liaised with the Department of Forestry and selected Msambo village because of promising likelihood of sustainability. There is a functional village natural resource management committee that has successfully established a 40-hectare village forest area nicknamed “Katsumba” through natural regeneration and tree planting over many years. Given that post-planting care and management is the essential ingredient for successful tree generation, this is a positive sign for the sustainability of the initiative. And the group donated 110 grafted mango fruit trees to the committee and a few leaders in the community. Publicity was also organised for the event to maximise outreach. The Deputy Minister responsible for the Ministry of Natural Resources, Energy and Mining, Honourable Werani Chilenga, MP (himself also a member of the Weather Chasers), acted as guest of honour. He was assisted by the Chief Director for Environment and Climate Change Management, Mr Bright Kumwembe. The Director of the Department of Climate Change and Meteorological Services, Mr Jolamu Nkhokwe, and colleagues also made several appearances on television news shows to spread awareness. 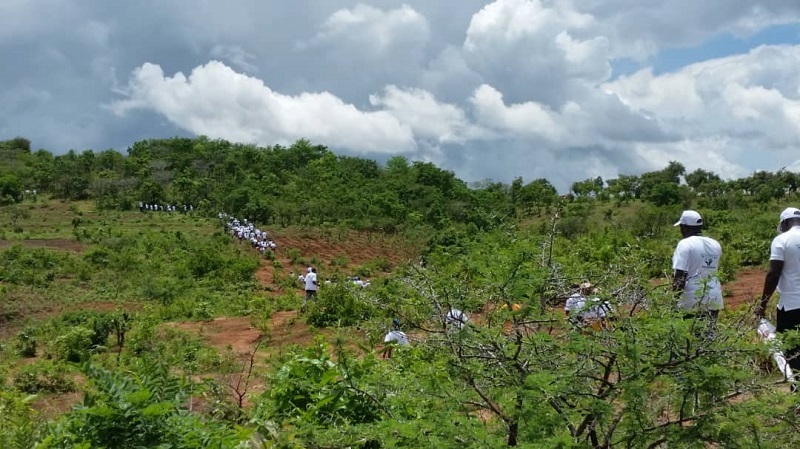 Chair of the tree planting committee, Sophie Makoloma from the international Non Governmental Organisation Christian Aid, said that her job was easy, “Everyone pulled together and contributed – both funds and their time – to ensure the event was a success. We plan to initiate a period of monitoring so that next year we can continue to build on our success”. As several team members mentioned after the event – the future is bright for Malawi with this calibre of leadership. In short, a perfect example of Mead’s words.